everything from one user interface. business-critical goals around compliance, eDiscovery, and security. 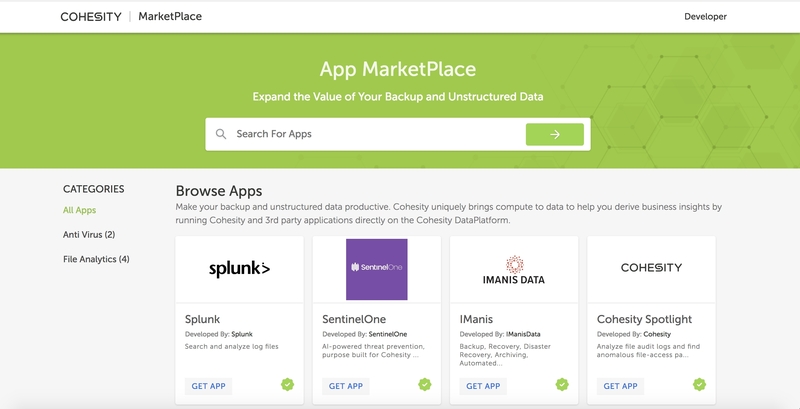 MarketPlace, featuring applications from Cohesity and third parties. senior storage and virtualization engineer, Hyatt Hotels Corporation. making it easy to deliver business outcomes from real-time insights. capabilities to ensure protection of modern NoSQL workloads. alerts on who is creating, modifying, accessing, or deleting files. and easily leverage customized scripts. use today,” said Peter Smails, vice president, Alliances, Imanis Data.